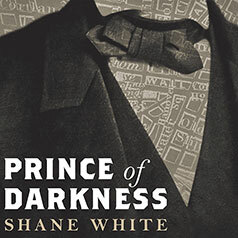 In Prince of Darkness, a groundbreaking and vivid account, eminent historian Shane White reveals the larger-than-life story of Jeremiah G. Hamilton, Wall Street's first black millionaire. In the middle decades of the nineteenth century Jeremiah G. Hamilton was a well-known figure on Wall Street. He was reportedly the richest African American man in the United States, possessing a fortune of $2 million, or in excess of $250 million in today's currency. In Prince of Darkness, a groundbreaking and vivid account, eminent historian Shane White reveals the larger-than-life story of a man who defied every convention of his time. He wheeled and dealed in the lily white business world, he married a white woman, he bought a mansion in rural New Jersey, he owned railroad stock on trains he was not legally allowed to ride, and generally set his white contemporaries teeth on edge when he wasn't just plain outsmarting them. An important contribution to American history, Hamilton's life offers a way into considering, from the unusual perspective of a black man, subjects that are usually seen as being quintessentially white, totally segregated from the African American past.